Kevin: I would put this on a parallel with something like DS9's "Call to Arms" as a season-ender that really is just suffused with energy. The teaser with the probe telemetry hit the right note. The pivot to the threat of Species 8472 was also well handled. I really was unsettled by Harry's transformation. I think it succeeded in really selling the point that they were a greater threat than the Borg. Matthew: The only lame aspect of Species 8472 is their catch-phrase. You know, if you're going to use Kes to give us exposition about them, why not something a little bit... more? "The weak will perish" is just a bit too laconic for me to latch on to. 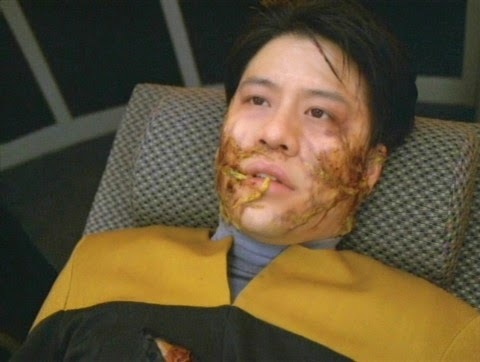 In "Q Who," we had Q deliver the exposition, calling the Borg "the ultimate user" in a wonderful scene. I wish that sort of scene were present here. Anyway, totally agreed on energy. This show was a rip-roaring good time overall. A good mix of scene types (action, tension, exposition) were married to snappy dialogue and a pretty good sense of stakes... we couldn't have known that Harry would be saved by People Magazine, could we? Kevin: My favorite part of the episode was seeing the tension between Chakotay and Janeway. It is fun to see this relationship tested. One of our complaints about the early seasons is that the Maquis plot was forgotten almost immediately. I really enjoyed seeing Chakotay dig in his heels. That said, I almost would have liked to see their positions reversed. Chakotay spent his life risking everything on a slim hope of protecting their homes or maybe have Janeway throw it in his face. Is risking war with the Cardassians different than risking revitalizing the Borg? Other than scale obviously. Beyond that, it was certainly fun to watch Janeway go off the rails a little. She has been the anchor and the voice of reason. and has rejected any number of extreme plans in the name of doing it then the "Starfleet" way, so watching her execute a really, really non-Starfleet plan is fun. Matthew: Building on that, I think what this episode did really nicely is put the burden on Janeway. The Leonardo scenes might strike some as superfluous, but these hypothetical people are wrong. They show us a captain blowing off some steam, trying to regroup and collect her thoughts. In another franchise, this might have been a dream scene, but I like it even more because it's a conscious character looking for inspiration and finding it. The dialogue was really nicely written in these scenes, as well. Kevin: If I have to frame a criticism, it's that there isn't really a lot of grander concept or sci-fi here. That's by no means catastrophic. Plenty of episodes work as pure action stories. The character work with Janeway and Chakotay is enough to keep it from being mere pablum, but I would have liked a reach for something. We're in the Borg's home, but I'm not left with the idea we're really going to learn something about them we don't already know. Kes' visions also wear a bit thin. We don't learn anything useful to change course, so it's just filler parading as foreshadowing. Also, the break for the two-parter is a little off to me. The Species 8472 attack feels out of nowhere and it snaps the real dramatic tension of the moment, can Janeway broker a deal and will Chakotay stand by it. Matthew: I agree that here is no real hard sci-fi. I suppose the setup will give us the chance for some, i.e. the completely "other" alien with whom we have extreme difficulty communicating. I am of course very much agreed on the notion of fleshing out the Borg. If we've agreed that he ship has sailed on keeping them mysterious and menacing, then we should flesh them out so to speak, giving them an origin. This could be a good chance, perhaps showing us their original homeworld destroyed or overrun by Species 8472. Kevin: Mulgrew is obviously the anchor of the episode, and she really nails it. She really delivers on fraying the edges of her character. I think it could have easily gone too far. Instead, it really reads like she is doing the grasping at straws that any of us would be doing in that situation. Either solution, giving up on getting home or trusting the Borg, seems impossible, and her resolve has this undercurrent of convincing herself as much as the crew. I also liked the debates with Chakotay. Both actors really mined their relationship to give the conflict some life. I will say that I found the parable a tad leaden. It may be the writing, because it really felt like it was inserted to justify the episode's title, but I remember just wanting Chakotay to get to the end of it, and I got the sense Beltran felt the same way. Matthew: I'm with you on Mulgrew. When she expresses frustration, it's always in the vein of a person of great control trying, and succeeding, at maintaining it. It's perfect for the character. Beltran has had a run of good shows - good for him, since they're about to come to an end. He really delivered "it's wrong!" with believable gusto. Kevin: The rest of the main cast was good. Lien's terror visions were okay. I will say that as much as we have not been bowled over by Kim's acting, and, sure, all he had to do is lie there, but he really telegraphed a sense of pain so intense you can't even scream. Picardo nailed a lot of technobabble. I think overall, the entire cast suffused everything with a good sense of tension. Matthew: John Rhys-Davies is the bomb. He knows it, too, but he doesn't show it. He totally inhabited the Leonardo character. Good accent, great physical carriage, great sense of wonder mixed with weariness. It's every bit the achievement that Jerry Hardin's Mark Twain was in "Time's Arrow," and looking at his appearances, I'm surprised he's only in two episodes! The character's presence looms larger in my mind at least. Kevin: I like the look and movement of Species 8472. I also like that they never get a name beyond that. It makes them feel more alien than any apostrophe salad ever could. The skin texture still felt very early CGI. It's not bad per se and it didn't pull me out of the moment, but it did not age well either. The makeup on Kim also looked pretty good. I liked the color palette. It looked...really inflamed, for lack of a better description. Matthew: This is one of the first times that the Trek franchise has had the wherewithal to try a fully CGI character integrated with live actors. While I agree it's not perfect, they make it work and it certainly doesn't detract from the episode. I like that they really went for "alien" here. Three legs, ropy necks, no identifiable face structures. The ship designs were neat, too, as was the "death star" superweapon effect. All in all, a really strong VFX episode. Kevin: I won't spend too much time on the Borg costumes, since it would be a retread of what we said in our review of First Contact. Everything looked good except for the ziggurat of Borg corpses. It looked like a video game cut scene and was almost a needle scratch in terms of gore, which Trek normally avoids. Matthew: Yeah, the body pile wasn't great, especially when they walked around it. Green (screen) alert! I liked the scene with Janeway on the Borg cube. They did some nice animations in the background. The overall look and movement of the space scenes was also good. They did a nice job of indicating movement, damage, explosive force, and the like. I'd say my favorite was the scene in which Voyager is sent reeling while trying to warp away. Kevin: This is a four. It has energy and tension and good character work but falls short of one of the qualities we normally look for in a 5. That said, a few off notes, like Kes' visions, don't destroy the narrative arc of an otherwise excellent episode. Matthew: Yep. A very entertaining show that sets up a premise well, raises the stakes for all concerned, but doesn't really deliver anything high concept. This was a near miss, since it also featured some top-shelf acting. But I agree with the 4 for a total of 8. Thanks for another great podcast! I didn't know Garrett Wang was potentially on the chopping block (or that he eek-ed onto a People's top 100 sexiest people list). I'm glad they kept him on, as growing up my half-Asian side appreciated the representation. Though I never felt "more attractive" because he was on the show, if that was indeed the reasoning :P.
One minor comment about Borg adaptation: I guess it never bothered me with how it was portrayed. I always interpreted that as they knew how to adapt to energy weapons, but they had to gather data about what the precise parameters of the weapons were during that encounter (i.e. frequency, amplitude, phase, etc). Losing a few drones at the beginning to infer these and then immediately re-calibrating their personal shields seemed in-line with the ethos of the Borg. What is up with Janeway's holodeck choices. Doesn't it bother her that she is just talking to an fake Da Vinci who probably can't offer her any better advice than say the computer that created the algorithm to create the fake Da Vinci.